Late adulthood diseases tend to have behaviors that differ in age-gender distribution whn compoared with each other by relying on peak age incidence-prevalence, age distribution of prevalence between the 5th and 95th percentiles, average age for incidence prevalence fo the 5% to 95%iles, measures of the irregularity of the bell curve for this 5%ile to 95%ile range, and intergender differences for each using a special formula designed for statistical significance focused curve comparisons (not provided here). An important difference between the above to pyramids to understand is the morbidity-mortality influences upon these curves. 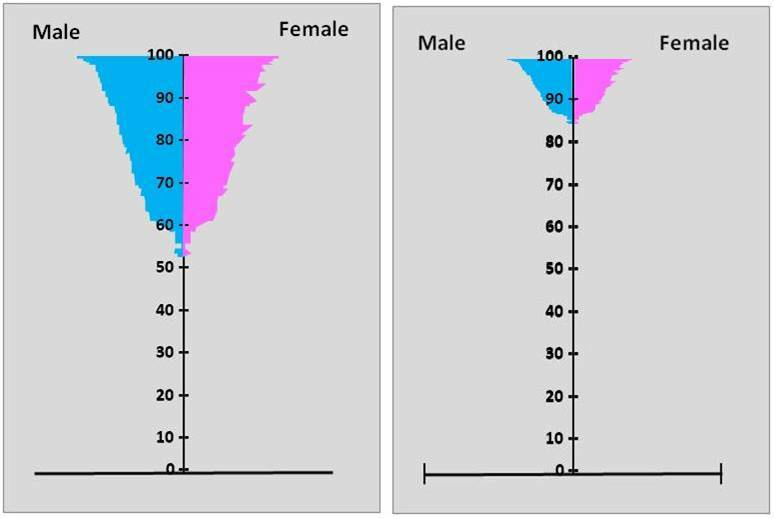 The peak age for the first curve (70) versus the second curve (80), with 5%-95% prevalence age ranges of 45-95 versus 62-96, demonstrates an outcome where mortalities due to increasing age begin to demonstrate an impact on the curve for their peak ages, with the second demonstrating a greater change in mortality over time than the first (the slope of the reducing prevalence curve). 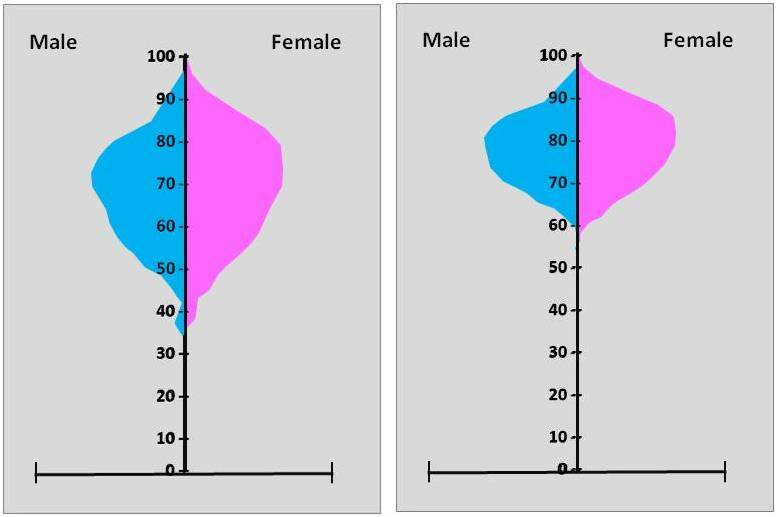 The fact that the “tip” of these curves is close to the 0-line at 100 years of age suggest that these conditions demonstrate a significant relationship with mortality. As the population of diseased individual approaches zero, so too does this ICD’s incidence-prevalence rates. The above is not the case for the following type of result, common to old age, non-fatal degenerative diseases. The above curves refer to chronic conditions that greatly impact morbidity, but are limited in their relationship with mortality. As individuals who bear this ICD along with several others pass away, those surviving comprise an increasingly larger percentage of the population due to their main ICD plus the accompanying other chronic or degenerative disease state. The perfect example of this is diabetes, which although the curve related to younger ages is different (demonstrated much earlier age development of cases), as the older individuals pass away, those who remain share Diabetes with another ICD, such as End-Stage Renal Disease, Diabetes Retinopathy, Peripheral Neuropathy, and other quality of life changes that ensue due to this lifelong chronic condition. The second of the above curves is also indicative of numerous other end-of-life disease or medical conditions. One of the most common series of ICDs linked to this behavior are those used to indicate dementia. Dementia is not fatal, and so the longer an individual outsurvives those with other fatal conditions, the more likely it becomes that the survivor will experience demention, or any of a number of other very old age progressive disease or medical problem states. The following conditions and ICDs tend to following this population health ICD pattern.